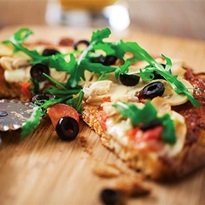 Veggie Pizza Focaccia Bread that's Deliciously Cheese-Free! This flavorful flatbread is pizza-esque, but doesn't require any cheese! If you have salt-free Italian seasoning on hand, you can use ¾ teaspoon in place of the oregano, thyme, and basil. To make the dough, in a mixing bowl, whisk together the whole-wheat flour, ½ cup all-purpose flour, yeast, and salt. Add the water and oil. Beat with a mixer until smooth. Stir in the remaining all-purpose flour to form soft dough. Turn the dough out onto a floured surface and knead by hand until consistent and elastic, about 4 minutes. Cover and let stand for 15 minutes. To make the topping, in a large bowl, stir together the mushrooms, tomatoes, green bell pepper, olives, onion, oil, vinegar, salt, pepper, oregano, thyme, basil and garlic powder. Grease a 15x10x1-inch jelly roll baking pan. Sprinkle the bottom with the cornmeal. Gently press the dough evenly into the pan. Generously prick the dough with a fork. Evenly spread the topping mixture over the dough. Bake for 10 minutes, or until the edges are golden brown.